This is why we check whether the castor fits. Just buying a couple of castors? Nothing could be easier. The best case scenario: go online, enter castors in the search field, find the ones you need and order them. Your delivery arrives, you screw the castors on, and the job is done. That might work out. If not, then the worst case has arrived: the castors can't withstand the weight and break, the rolling resistance is too high and nothing can be moved. Or the classic situation occurs: the castor can't event be fitted, because it features the wrong type of mounting. We don't want you to order the wrong size or wrong material. This is why we have compiled some helpful information for you. The questions that customers ask about our wheels and castors formed the basis for this guide. If you need to know something about a specific topic, then simply choose the corresponding section. A wheel is a wheel. And what does this involve? A wheel is made out of a running surface/tyre, rim and wheel bearing. It's that simple. From the wheel to the castor. How? By installing the wheel in a housing. Depending on the type of housing, the result is a swivel castor or a fixed castor. 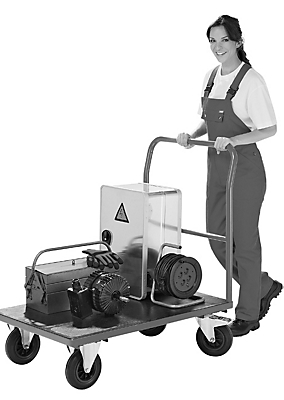 The swivel castors can be rotated 360° by using a ball bearing mounted swivel bearing, ensuring good manoeuvrability. The fixed castors, in contrast, cannot rotate and are fixed in place, and ensure good directional stability. In most cases, 2 swivel castors and 2 fixed castors are affixed. Our swivel castors come with double stops. But what does this actually mean, and which types of wheel stops are there? Double stop means that the motion of the wheel and the direction in which the swivel bearing/fork head turns can be blocked. The double stop is easily activated by a step of your foot. The advantage: it offers much better stability compared to wheel stops. A wheel stop only stops the motion of the wheel and a directional stop only stops the swivel bearing from turning. There are six different ways of mounting our castors. Not every one is suitable for every type of wheel or castor, and each features important points to observe. This is the most frequently used type of mounting. The castor is screwed onto the equipment using a plate attached to the housing. Please note the plate dimensions, the screw hole Ø and the spacing between screw holes. The expander is inserted into a hole in the equipment, or into the end of an installed tube. The screw placed through the bolt hole in the castor splays when the expander is tightened, and can be securely fastened in place. Important: the expander must fit in the inside tube Ø for the wheel to be securely seated. Please note: bolt hole fitting is only available for swivel castors. A bolt is inserted through the hole in the back. 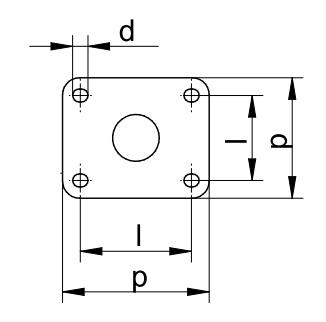 Please note the plate Ø and the bolt hole Ø. Please note: threaded pin mounting is only available for swivel castors. The screw provided is inserted through the bolt hole in the castor housing. Standard threaded pin sizes in this case are M8, M10 and M12. Please note the threaded pin Ø and the length of the threaded pins. They must be suitable for the device. Please note: pin mounting is only available for swivel castors. The castor is mounted using pins with a cross hole which is located in the holder integrated in the equipment. The castor is attached to it by fixing a pin or screw through the cross holes in the holder and pin. This is a typical type of mounting for office chairs. It can be easily fitted without tools. Please note: the diameter and the length of the socket pin must fit the holder on the equipment or office chair exactly. It's best to make a note of the dimensions of an old castor you have removed. Castors and what they do. Do you move trolleys, furniture or devices frequently or rarely? Do you move them quickly or slowly? 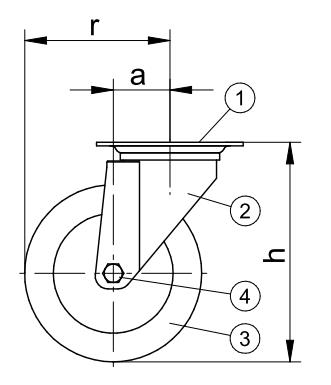 You should answer these questions before deciding on the wheel bearing used with your castors. Find out here which wheel bearing is best suited to your needs. Simple, largely maintenance free bearing. Shock and impact resistant. Suitable for use in damp environments. For low-speed devices (max. 4 km/h) and for short distances. Sturdy, hardwearing, largely maintenance free bearings. Low bearing friction. Shock and impact resistant. Permanent lubrication. The most frequently used bearings for low-speed devices (max. 4 km/h). Smoother rolling compared to plain bearings. For speeds of up to 4 km/h and heavier loads. Low rolling resistance when in use, low roll resistance. You need wheels or castors, and don't know which ones will suit your requirements exactly? Then we can offer you a few reference points to make the choice easier. One thing first: ideal wheels or castors suitable for universal use and for any purpose don't exist. There are too many interrelated criteria. How much does a wheel/castor have to carry? It is divided by 3 because on uneven flooring, even an item of equipment with 4 castors will only have 3 castors in contact with the floor, and these 3 then carry the full weight. The load capacities specified in our product range for wheels and castors apply for speeds of up to 4 km/h and an ambient temperature of 10 °C to 30 °C. Is the floor rough or smooth? Is the floor covered in tiles, concrete, carpet, or is it heavy duty industrial flooring or a highly sensitive wooden floor? In general, the following applies: soft castors for hard floors and hard castors for soft floors. This creates the best prerequisites for transporting objects quietly and smoothly. Choose non-marking castors if you wish to avoid leaving rubber tread marks. If there are ground sills, extra load capacity must be factored in. Choose wheels with plain bearings and stainless steel housing for areas in which foodstuffs are processed, canteens and wet surfaces. Is the equipment moved only on occasion, or all the time? 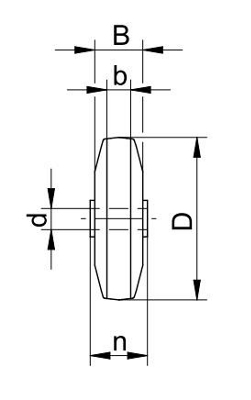 Choose the corresponding wheel bearing here (top). Every site of use involves specific requirements. Moisture, cold, heat, temperature fluctuations, electrical conductivity and chemicals affect the durability, rolling properties and the smoothness of motion. Are there specific conditions like this in your area of use? Then please ask us before making an order. We will help you choose the most suitable wheels! Roll resistance The force required to start the wheel moving from a standstill. Tip: if possible, choose a larger wheel. Rolling resistance The force required to keep the wheel moving uniformly. Tip: if possible, choose a larger wheel. Temperature resistance The temperature range in which the wheel will be used. Please note that there are special castors suitable for use in cold storage facilities. Chemical resistance The wheel's resistance in the event of contact with diverse chemicals. Please send us a data sheet and an enquiry! Resistance to abrasion The resistance of the wheel running surface to mechanical wear. Non-marking wheels/castors Non-marking means, for example, no rubber tread marks on linoleum, tiles or wood. All PU wheels, solid rubber with tyres and all correspondingly specified items in our product range are non-marking. Shore hardness The hardness of the surface of wheels and rollers has an affect on the smooth running and comfort. This hardness is given with a shore value. This scale goes from 0 (extremely soft) to 100 (extremely hard). In accordance with standards DIN 53505 and DIN ISO 7619-1, the hardness of wheels and rollers is determined using different methods. Correspondingly soft materials are named Shore A hardness, hard materials after Shore hardness D.
Depending on the site and the purpose of use, the material which the wheels and castors are made of plays an important role. The following table shows you how well each of the materials available from us satisfies the most important requirements for your wheels.